We are moms (and a grandma), daughters, wives, teachers, and friends. We are ordinary women, just like you, who have experienced hard stuff in life, just like you. But we are also women who have incredible joy because Jesus has given us hope – and continues to give us hope – in the midst of even our toughest realities. 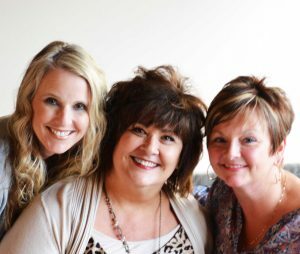 We are three women who have a dream of sharing that hope of Jesus with you. 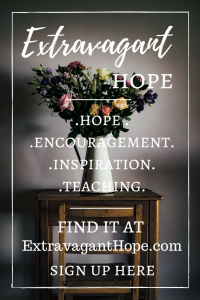 Extravagant Hope is a ministry for women by women offering hope in an uncertain world. We have a love for God’s word, the bible, and believe that it is the best way for us to get to know God as he has revealed himself. We believe God’s word is true and has the authority to speak into every life situation. It teaches us, guides us, and changes us. We believe both the Old and New Testaments have incredible relevance for us today, and we’re excited to share it with you. Life is tough. We all have hard stuff we deal with: Stuff that weighs us down and makes it difficult for us to face the day let alone the future. Then we take a look at the news. *Sigh* It’s easy to be discouraged…or frightened. Around the world, trouble looms. Joblessness. Homelessness. Cancer. Alzheimer’s. Shots fired. Buildings burned. Sexism. Terrorism. Natural disasters. Human disasters. Political conflict. Racial conflict. Human traffickers. Suicide bombers. Homicide. Genocide. Suicide. But take heart – there is hope! Jesus has overcome the world. All the struggle. All the conflict. All the pain. All the suffering. Even death. Jesus has overcome it all. In this hope, in Him, we find the courage and the confidence to live and thrive in the midst of the chaos and uncertainty. In Him we have the promise of eternity. We have the assurance that we are loved no matter what and that we will never be alone in anything we may face. We have the chance to start again. We have strength in our weakness and power in our pain. Because of Him, we too will overcome. In Jesus is a hope that is more lavish than we could ever expect or imagine and more than we deserve. It is an Extravagant Hope. How do we live in light of this hope? Want to come along with us as we find out? We all need hope. Let’s ponder it, explore it, and even run like mad for it – together. Like what you see? 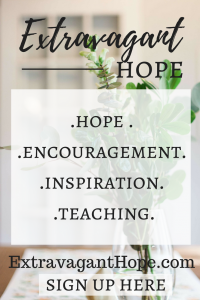 Follow us on Facebook and Twitter, and let us send you hope, encouragement, inspiration, teaching, and lots of freebies. Yes, I want to receive HOPE in my inbox!